As spring is in the air in the northern hemisphere and those in the southern hemisphere start setting their sights for the arrival of winter, a lot of crocheters and knitters find that their crafting changes along with their wardrobe. Have a look through your finished projects and explain the seasonality of your craft to your readers. Do you make warm woollens the whole year through in preparation for the colder months, or do you live somewhere that never feels the chill and so invest your time in beautiful home wares and delicate lace items. How does your local seasonal weather affect your craft? Well I'm definitely a knitter for all seasons. My family would think there was something seriously wrong if I didn't have at least one pair of socks on the go at any given time (currently 3 different pairs on the go, but that might have increased by the end of typing the blog if I've forgotten any!). 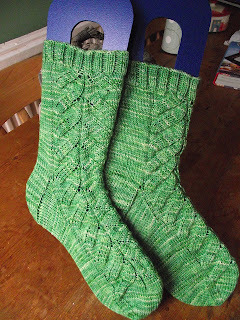 So I'm certainly an all-year Sock Knitter. These are my rather lovely Tadpoles, which I actually kept for me. Soft, squooshy and Spring Green! I do find myself knitting at lot for other people, as I find it lovely to give handmade / hand knit presents to selected victims. Bearing in mind I must have knit 20 - 25 pairs of socks, there is a limit to how many pairs a girl can wear. But I do find my 'Gift Knitting' increasing around Birthdays and Christmas. So not weather affected as such, but certainly seasonal. And as for spinning, that's more when I get time! Last night saw Tessy the Ashford Traveller Spinning Wheel in action as my adorable friend Lucas, who is 7, sat on my lap as he treadled and I span some fleece. I reckon we did a pretty good job! 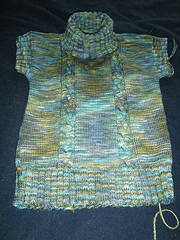 Again, apologies for Non-Ravelry users if you can't see the links for my projects.